These are the only directions you'll need on November 26, Sunday, as you head to #LoveSquad, LoveYourself’s fast, easy, and totally anonymous HIV screening day event at Victoria Court Malate. It's from 10 a.m. to 7 p.m., so grab your squad and be sure to drop by. And don't forget to register at go.loveyourself.ph/lovesquad. You'll receive a confirmation message two days before the event (November 24, 2017, Friday). It will take you about 10 minutes if you walk from LRT-Quirino Station / Taft Avenue. You could also ride a public transportation vehicle going through Quirino Avenue. Ask to be dropped off at Victoria Court, which will be at the right side of the street. It is only a 5-minute walk from Roxas Boulevard. You could also ride a public transportation vehicle going through Quirino Avenue. Victoria Court will be on the left side, so you will need to cross the street. Driving? Use Google Maps or the Waze app. Just search for “Hotel Victoria De Malate” to see a detailed map of the vicinity. See you on November 26 for #LoveSquad. Register at go.loveyourself.ph/lovesquad beforehand to ensure a slot. 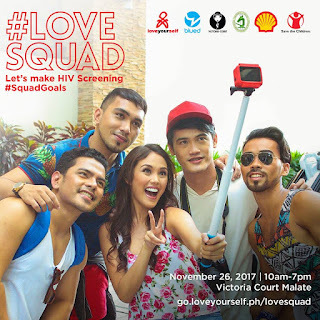 Call the rest of your friends, too, and make HIV screening your #SquadGoals!